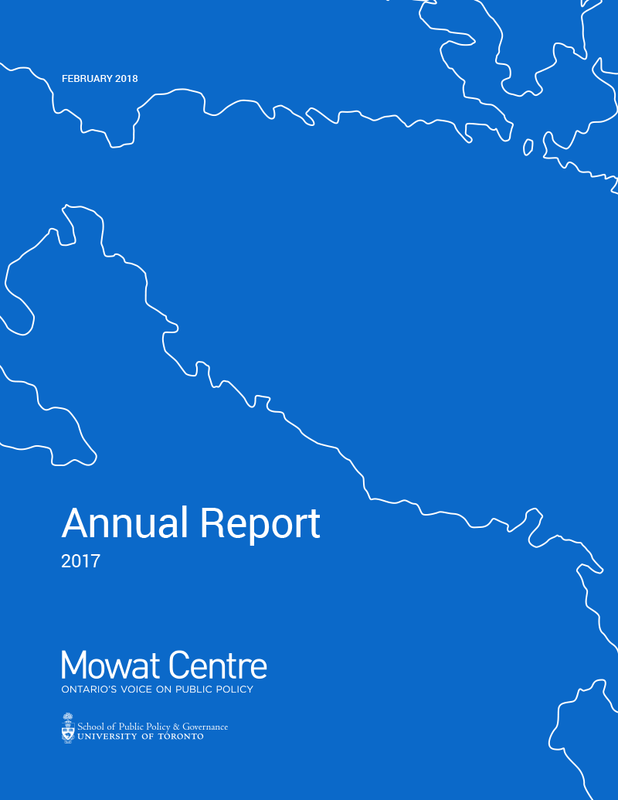 Mowat Centre’s annual report provides an overview of our publications, activities and public policy impact for the 2016-17 year. In the following pages we present our 2016-17 annual report. This was another productive and impactful year, one of the many reasons I was so pleased to join Mowat as its new director towards the end of this reporting year. Governments and politician continue to draw on our work. In Ontario, three of our reports were cited in the 2017 Long-Term Report on the Economy, with two other reports cited in the 2016 Fall Economic Statement and the backgrounder to the 2016 Speech from the Throne. The Ontario government’s Impact Measurement Task Force used another one of our reports as the principal framing document for its work. The government of Ontario also chose one of our events to launch its five-year Social Enterprise Strategy. Two other Mowat reports were cited during floor debate in the Legislative Assembly. Even the Environmental Commissioner of Ontario cited us in one of her reports. Federally, a formal federal regulatory impact assessment singled us out among organizations calling for the elimination of the new entrants and re-entrants (NEREs) provisions from Canada’s EI Regulations when that change was introduced. Our work was noted on the floor of both the House of Commons and the Senate, and in committee action in the House. Our work was also cited in official reports from government agencies in British Columbia and Manitoba, and in staff reports to council committees in the Cities of Toronto and Vancouver. We were also cited in consultants’ reports commissioned by the UK Department of Education and government agencies in Canada, Germany and Finland. The media as well continue to pay close attention to our work. Twenty Mowat reports were covered or cited in the media this reporting year, with media in all provinces and territories except Nunavut and Yukon citing us and our work. The Globe and Mail, National Post, MacLean’s, the CBC, CTV, Global TV and BNN are among the major outlets covering or citing our work, and even Denmark’s public broadcaster cited one of our reports in an online story. Our work on how governments should respond to technological disruption and prepare for the new world of work has been of particular interest to policymakers, the media, stakeholders and the general public. During this reporting year we presented our work on these issues to the open caucus of the Senate of Canada, Treasury Board Canada, Ontario’s Minister of Economic Development and Growth and the Ontario Ministry of Finance, among others. We have also become go-to experts for both print and broadcast media seeking impartial commentary on these issues, and Working Without a Net is already the most viewed report on our website. Seven different professional associations invited us to present on these issues as well. Indeed, our broad expertise as a forward-looking voice on Canadian federalism, the role of evidence in policymaking and the future of public services and public service delivery was well recognized this year. We were asked to present on these issues to two visiting delegations of public officials and policymakers, one from the Ukrainian government and the other from the Province of Jiangso and the City of Nanjing, and to a retreat for executives and managers from the Ontario Ministry of Finance. The broad appeal of our work was also evident this year in the fact that academics and policy researchers based on every permanently inhabited continent in the world cited our work. Our two research hubs also continued to engage in exciting major projects this year. Mowat Energy undertook an analysis of what emerging energy trends such as the introduction of distributed energy resources could mean for Ontario, for which it commissioned six reports from leading international consultants and produced two reports of its own, with an international conference to follow in 2017-18. Mowat NFP undertook a major project on impact measurement in the not-for-profit sector, organizing a high-profile event that was used by the Ontario government to launch its social impact strategy, and releasing a report that served as the principle framing document for the work of the Ontario government’s Impact Measurement Task Force. Later in the reporting year Mowat NFP launched a new series of reports, which will continue into 2017-18, focused on how government and the NFP sector can work together to foster an environment that better enables not-for-profits to carry out their mission. In short, 2016-17 was another year in which Mowat’s voice was heard and respected across Canada and beyond, on a variety of issues across our research streams and hubs. As Mowat’s new director, I am committed to continuing to expand the Centre’s reach and partnerships through forward-looking, evidence-based policy research and communications. We want to express our continuing appreciation to the University of Toronto and to the School of Public Policy & Governance for their ongoing partnership, support and encouragement. The School and the administration have provided a nurturing intellectual environment that both enriches our work and enables us to play an influential role in Canada’s public policy conversation.